The payroll card market flourishes while provider consolidation continues. 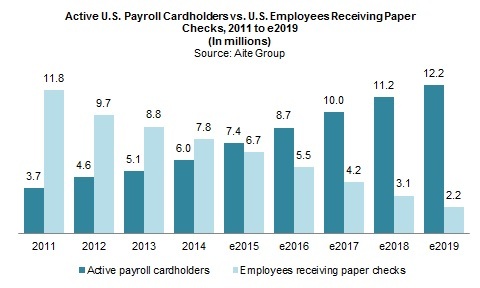 Boston, April 8, 2015 – Possibly the most complex product niche in the prepaid card category, payroll cards are swiftly usurping paper checks as employers’ preferred back-up alternative to direct deposit on checking accounts, and they represent one of the largest growth opportunities. Still, market complexities, regulatory conditions, and competing priorities have proved too perplexing for some providers that have opted out of the business. Will only the largest players survive? Or can strategy and forethought change the game? This research, based on 2015 discussions with leading payroll card providers and ongoing discussions with senior prepaid industry executives, sizes the card loads and potential active card numbers through 2019, identifies what’s fueling the market, reveals market share data for leading players, and recommends growth and survival strategies. This 19-page Impact Note contains 10 figures and two tables. Clients of Aite Group’s Retail Banking & Payments or Wholesale Banking & Payments services can download this report.